Even as I'm straining to get a better view of her jewelry--earrings with vivid green stones (and in other pics, a bracelet beaded with stones resembling rough rubies)--and her swank Balenciaga maternity(!) gown--what really pulls this look together is the hair. Instead of overshadowing, the way a typical awards-show updo would have done, this style is a golden frame around eyes, glowing complexion, simple makeup and deep green jewels. Imagine a stuffier hairstyle with the exact same gown and jewelry, and it's instantly aging. Even though she didn't bring home any statuettes last night at the Screen Actors Guild Awards, Cate Blanchett kicked off awards season looking radiant on the red carpet with soft, beautiful waves that brought out her natural beauty and pregnant glow. MATRIX celebrity stylist, Mark Townsend, was the man behind the look and has the scoop on how to get this simple yet beautiful hairstyle. Townsend has been working with Blanchett for nearly four years, so it doesn't take long for the pair to decide on the perfect style for big red carpet events. As soon as Cate tried on her stunning Balenciaga gown for the Screen Actors Guild Awards, the entire fashion and beauty team agreed that her hair should be down and simple so as not to overpower her intricate gown. To achieve the look, Mark first took Cate's damp hair and applied Biolage Hydro-Foaming Styler all over to add a little texture, and then blow-dried her hair with a medium round brush. When the hair was completely dry, Mark used a one inch HAI Elite curling iron, taking random sections of hair from one to three inches in size sections of hair, and wrapping them around the iron. According to Mark — the trick to getting perfect waves and curls is to never actually open the iron, just wrap the hair around it while closed. When finished, Mark rubbed Biolage smooththérapie Smoothing Serum in the palms of his hands and raked it through Cate's hair to soften the curls into soft, loose waves and blend the curled pieces with the straighter pieces of hair. 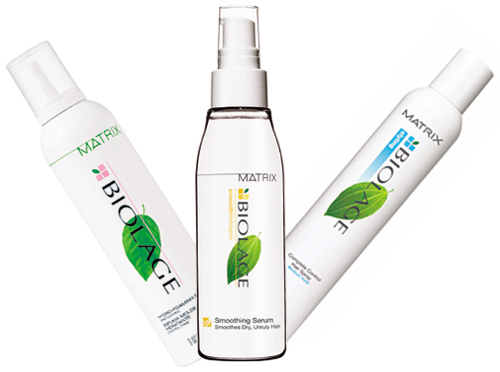 To finish, Mark used Biolage Complete Control Hairspray to softly set the look so it lasted all night. Hm, it looks a little messy and matted to me, but I agree that the first thing you notice are those vivid green earrings. My first thought was, "Oy, great color on her." 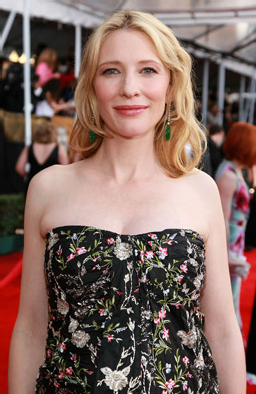 I adore Cate Blanchett, truly one of the finest actresses we have today. It makes me really angry to think Gwyneth Paltrow got the oscar that one time for Shakespeare in Love and it's like, PALTROW!!!? HOLLYWOOD NEPOTISM! Weeellll...I saw Shakespeare in Love. It was good, there's no doubt about it. Most American actors can't do English accents, for the same reason English actors usually end up doing American Southern accents--there isn't quite such a thing as a generic English or American accent. The only way to emulate is to choose a specific region, and that takes more time to study. There is a definite "shmooze factor" in Hollywood. Spike Lee always got passed over. It's not a reflection of the quality of work by any means. It's a fine movie, but the day that they pass up Cate Blanchett in favor of Paltrow is the day I stopped watching the Academy Awards. There's a stone called chrome diopside that looks sort of like those earrings--at least it does on the Net. I've never seen it in real life. Yeah, they've been giving the wrong awards to the wrong people since the very beginning, eh? Judy Garland never got hers for A Star is Born and neither did Bette Davis for either All About Eve or Whatever Happened to Baby Jane? Hm, the box I sent you should arrive in a week. I've included to tiny pearls, perhaps they could go atop a deep purpley amethyst in a similar style, though perhaps less dramatic. And in gold, since that would match better. I did a little digging, there wasn't much info about the green earrings on the Net. Unusual, since part of the point of having celebs wear jewelry is to publicize the jeweler. I found one article which said they were "natural jade and diamond." That's some jade! Ya know, the more I'm doing this, the more complicated it seems to get. Odd, because I always thought it would get simpler. The mechanical aspect of making the stuff has definitely become far easier, but the design part just gets deeper and deeper. I think that's probably true of anything. Look at people who design clothes, for chrissakes. Karl Lagerfeld sends a model down the runway in a denim bra and everyone's like, "Oh, that Karl. He really knows how to demonstrate the French attitude for play. Of course, he's genius. I love him." Eh...people can become lazy once they become successful. They tried much harder when they still had to struggle. It can backfire though. People get bored if you keep churning out the same old thing, no matter how prestigious your name has become. It is odd though...before, I thought, all I have to do is get good at the mechanics, and come up with a few really good "templates." Then just plug in different stones. lol I have yet to be able to do that. Each stone and cut and size seems to require its own design. I suppose I should see it that way...start with the stones, then figure out what to do with them. What I found intriguing about jewelry design is how it's not intuitive, in a sense. You take a little bit but you can use it many, many ways. That's kind of cool, in the sense that I've always really liked jigsaw puzzles. Jewelry design is rather like that to some degree. I was in Jo-Ann fabrics the other day getting a clasp for the pearl strand, and I noticed that these cloudy lavender beads would really work well with amber drops. They contrast perfectly with each other, and yet, they are slightly unexpected, no? It's interesting to me because you want the piece to look, somehow, whole, at a glance, so that you can wear them and not have to think about it too much. And yet, they should have some excellence as you draw closer in. Ehhh... that's making no sense. Like a NARS duo. Lol.